October should be quite an interesting month for all! 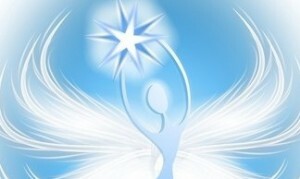 It starts out with a “bang” and will end with a lot of powerful and transformative energies! First of all, this month’s vibration in numerology is a 16/7. The number “16’ is a karmic number which brings big changes in our lives. Usually this is indicative of huge transformation in the circumstances or situations in our lives that brings the individual to a place of internal growth and evolution on a soul level. 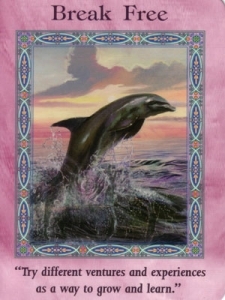 In Doreen Virtue’s Angel Tarot (which is the main deck I use when I do the monthly and weekly card readings on Angel Messenger), this card is depicted by the major arcana card called “Life Experience” which is about a wake-up call, a new revelation, liberation and/or rapid inevitable change. These keywords certainly describe the astrological energies that we start, and end, the month of October with. The month begins with two very powerful astrological configurations. 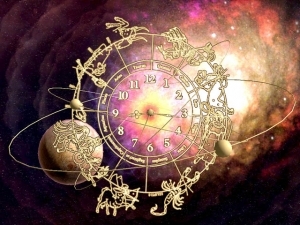 The first is what is called a T-Square by astrologers, involving the Sun, Uranus and Pluto. The Sun is in Libra, the sign of balance, harmony and partnerships. It is opposite, or opposing, the planet Uranus which is about freedom, rebellion and unexpected or surprising change. When we have two planets opposite one another, their energies are always experienced through other people in our lives as they serve to be a mirror to us. Then we have both the Sun and Uranus in a square aspect to Pluto, the planet of BIG change, transition and transformation. This T-square pushes us to make changes in our lives that are necessary for our Highest growth and evolution and it will, most likely, involve all types of relationships in our lives……..romantic partnerships, business partnerships, career relationships, and home and family relationships. There is an element of change and breaking free of old energies here. 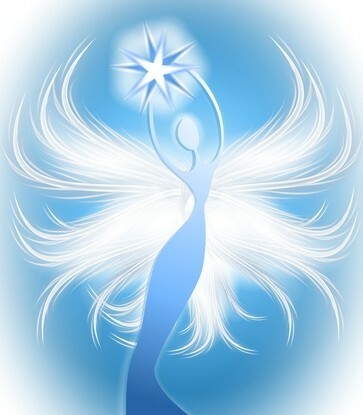 This does not necessarily have to be negative, but it does “shake things up!” The energies in these areas of our lives are no longer able to sufficiently operate in the same manner that they have…….this is why transformation is in order. The other significant astrological energy that starts the month off is Saturn, planet of restriction, limitation, karmic lessons, manifestation and structure, in an inconjunct aspect to Uranus, the planet of revolutionary energies and sudden and unexpected redirections. This energy is attempting to assist us in breaking free from restrictions and limitations of the old paradigm of energies that are being experienced on the planet and in our lives. It can be an uncomfortable energy as the adjustments are being made, both individually and collectively, to bring forth a new dynamic of the experience of freedom on some level in our lives. At the same time we are experiencing all of these energies, we have the Sun inconjunct Chiron, the Wounded Healer, and also Saturn in a harmonious trine aspect to Chiron. This will bring up old wounds regarding our balance of self vs. others and helps us to secure the energies of healing in our lives, physically, emotionally, mentally and spiritually that will benefit us as we are going through all of these transitions and changes. Venus, planet of love, relationships and money, is in the sign of Scorpio at the beginning of the month and just starting to separate from its challenging square energy to Mars, planet of desire, passion and forward movement, which is currently in the sign of Leo. This energy was strong towards the end of September and brought some tension or interesting situations in the areas of relationships and finances. This energy is now beginning to dissipate but may be the catalyst for some of the other energies we are now experiencing at the start of this month. We have a New Moon in Libra on October 4th at 8:34pm EDT. This New Moon occurs at 12 degrees Libra and is also a part of this Sun, Uranus, Pluto T-Square energy……….in fact, it now involves Jupiter as part of a Grand Square configuration and will be felt for a few days following the actual New Moon. Jupiter here brings in the energy of expanding our belief systems and evolving beyond what we previously thought to be our truth. To put it more simply, whatever redirections and transformations are experienced in the first few days of the month (and even as early as September 26th) from the T-Square, will allow us to evolve and grow as a soul……………..to bring us to a place of encompassing, accepting and integrating new perceptions of what we thought, previously, to be our truth and our reality. Venus will move into the sign of Sagittarius on October 7th. This will certainly lighten things up in relationships. Venus in Scorpio is deep, serious, magnetic, possessive and passionate……..here in Sagittarius it will be more fun, light-hearted and freedom oriented. Her “partner in crime” Mars, will move from the sign of Leo into the sign of Virgo on October 15th. Mars actually likes being in Leo……..Mars is a fire planet and Leo is a fire sign so there was a lot of passion here as well, although of a different kind. Mars in Leo is passionate about moving forward in projects and circumstances in life. It displays much courage, forward momentum and fun-loving energy! When Mars moves into Virgo he will become a lot more serious…….putting his efforts into work and paying attention to details to get things accomplished. We have a Full Moon Lunar Eclipse at 7:38pm EDT on October 18th at 25 degrees of Aries. Because this is still the Aries (Moon) and Libra (Sun) axis we can expect a lot of these powerful energies to be related to relationship and partnership situations in our lives………intimate, business, friendship and family. Mars in Virgo is opposing Neptune in Pisces (which becomes exact the next day) during this full moon so expect some weird situations…………….things may not be as they seem, there may be some confusion, illusions or delusions and there may be some unexplained obsessive energies that occur. This is even more likely to be true because we have Mercury going retrograde at 18 degrees Scorpio on October 21st, less than three days after the full moon. 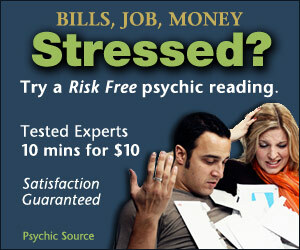 This may cause miscommunications or unclear messages being given or received from people. Mercury will be retrograde until November 10th but is in its shadow period from September 30th until November 26th so you may feel the effects long before and after the actual retrograde cycle. You may want to use this time to clear up any confusions in communication with those in your life, review the details in your current projects or life circumstances, research new ways to accomplish things and reflect, meditate and search for the truth within yourself. As we go through the second half of the month Pluto, planet of transformation and regeneration is coming closer to a square aspect with Uranus, planet of innovation and enlightenment. This will be the fourth of seven squares between these two planets with the first being on June 26th 2012 and the last one occurring on March 17th 2015. The squares between these two planets are what is bringing forth the massive change and transitions on the planet, in our government and within our lives. We are all evolving with the assistance of the galactic and universal energies……..Gaia, our planet, is going through her changes………………governments and organizations of the old paradigm are crumbling…………..humanity is becoming aware and seeing things from a new perspective……………..and we, as individuals, are shifting in our energetics…………….our physical bodies, our energy fields, our belief systems and how we view ourselves as part of the microcosm within the macrocosm of Source-God Energy…………..this is a grand time! 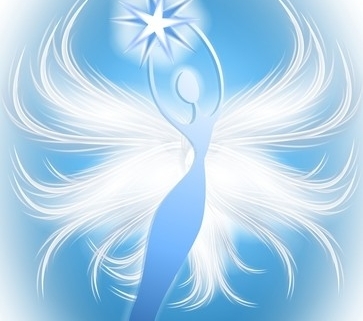 Additional messages from the angels for this month are to take the time to balance, center, meditate, and use positive affirmations to assist with all of the changes that are going on around you and within you. In doing this you can be more assured that the inner guidance you are receiving in certain circumstances and situations in your life is real and trustworthy. They are also sharing that in relationships, allow yourself to become the mirror in situations that you encounter………in other words, because we are all going through a lot of evolution and growth with the Higher Vibrational energies on the planet, attempt to see the other persons perspective when it comes to challenging situations. 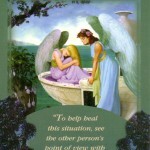 Interesting that earlier this month, I was guided to write an extended description for one of Doreen Virtue’s angel cards called “Grace and Antoinette” which is posted on Angel Messenger. 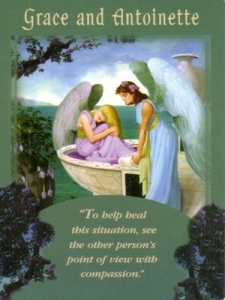 This card description describes perfectly the message that the angels are giving us for this month. It is definitely an exciting time filled with much transformation and change that will ultimately benefit us on our soul’s evolution and journey as we expand our energies and recognize the true essence and spiritual power that we carry within ourselves!